There are a lot of gumbos out there, and although their ingredients may vary wildly (shrimp, sausage, okra, tomatoes, crab, filé - or not), this stew is always flavorful and hearty. I did not grow up in Louisiana, but have enjoyed many bowls of this legendary dish on visits there. And one thing I've come to learn is that although the variations are endless, you don't have to live in New Orleans to master it. 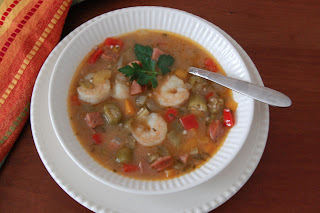 So along with my recipe for Shrimp and Sausage Gumbo, I've also included step-by-step photos with instructions. Enjoy! Thanks for stopping by. I enjoy creating new dishes, but with over 800 of my recipes published, I have many old-favorites, too. So that's what you'll find here, a mix of the new plus some that are tried-and-true. There's a ridiculous amount of recipes out there, but finding some good ones just got a little easier. Enjoy! A great-tasting muffin awaits. . .